Never thought I’d actually come to miss and have fond memories of living in East Boston, but I do. And most of these memories come from the great variety of cheap, hole-in-the-wall restaurants and the modest but always satisfying dishes they are almost always characterized by. 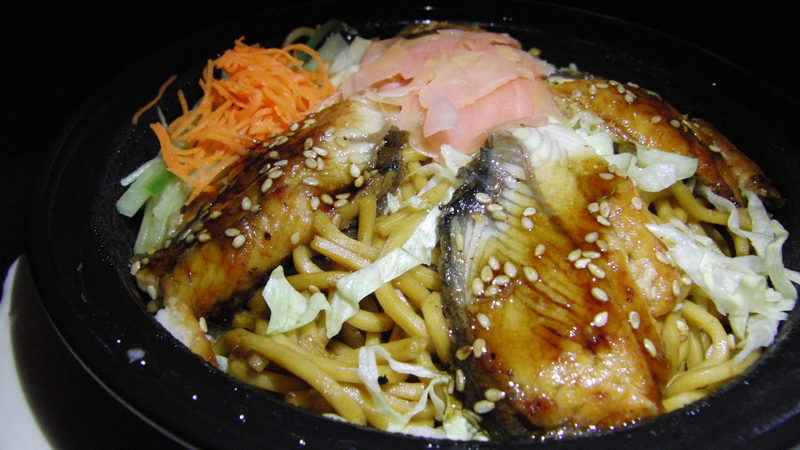 Although I’ve never actually been to Teriyaki Yummy in person (it’s out in Chelsea), I can still to this day recite its delivery menu which featured a vast range of Japanese and Chinese dishes, from wonton soup to dim-sum, from stir fry noodles to sashimi. Everything was good. This bun is the protagonist of the dim sum platter at Teriyaki Yummy, truly comfort food therapy. 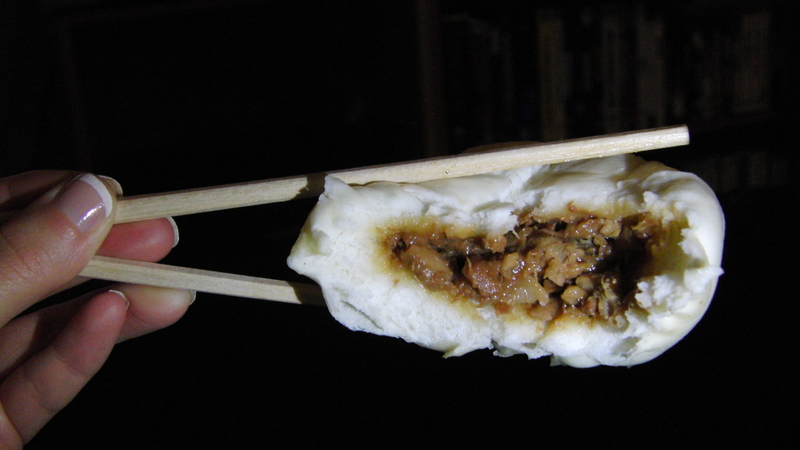 The bun itself has the consistency of homemade marshmallow, a fluffy, light cloud of delight. The roasted pulled pork filling is incredibly flavorful and without making it soggy or moist even, sits patiently in its airy environment, waiting to peek out when bit into. I have a new-found love-affair with these bun and although the rest of the platter is not AS miraculous (pork and veggie dumplings, some kind of shumai and sweet steamed dessert buns) I look forward to biting into them some time in the near future. A brilliantly fresh take on an otherwise overdone stoner food favorite. 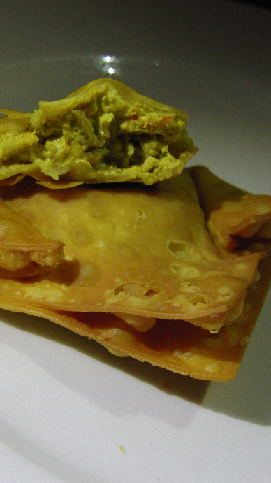 The curry mixes with the flaky (real) crab meat, and send a spicy shiver down your spine. The filling is light and does not overpower the wonton, allowing it to shiny through in all of its crunchy glory. Deliciously slimy, smokey eel doused in a very flavorful teriyaki sauce and sprinkled with toasted sesame seeds on a tender bed of lo mein. Spicy salmon tempura, avocado and spicy salmon on top. The rice was a bit too soft but the tempura had a great crisp texture. 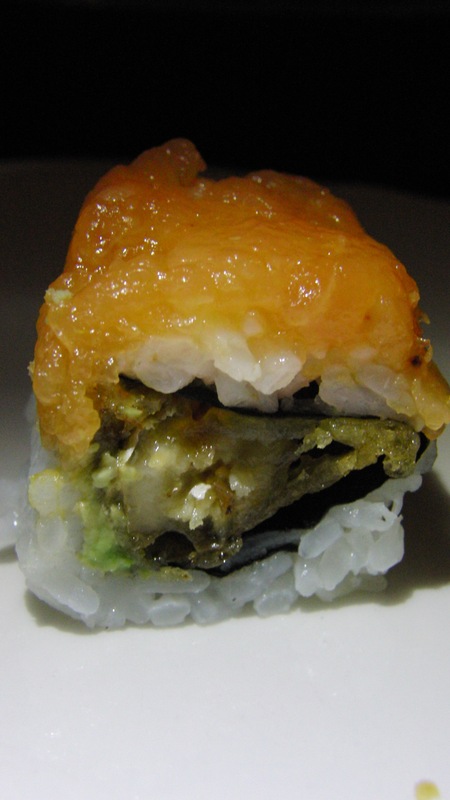 The mushy, cool spicy salmon blended with the fresh avocado inside the roll very nicely.